When Joanna Lubkin began college at Clark University, she was in love with Jewish ritual and culture. But once she graduated, Joanna realized that her BA in Jewish Studies wasn’t enough. She wanted a way to connect her passion for Jewish life with her commitment to social justice. Joanna decided to pursue a Masters in Public Administration, but after completing it she was still searching. Enter the Jewish Organizing Fellowship. “I applied for the Jewish Organizing Fellowship hoping that it would teach me practical skills to create social change. It did far more than that. The Fellowship and my placement at a union for medical residents radically transformed me. I learned to address the root causes of social problems rather than focusing on band-aid solutions. I learned to ask probing questions, tell my story, and develop leaders who could effectively take action. I also began to envision the world as it could be. “Unexpectedly, I found incredible mentors in the rabbis who led our Fellowship trainings. These rabbis had found inspiration for their social justice work rooted in Jewish tradition. They had helped congregations understand the connections between justice work and the Jewish community’s spiritual heritage. 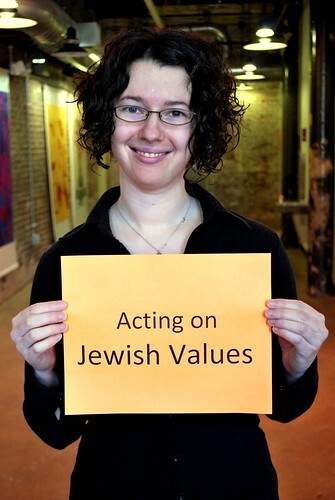 Joanna is fighting to act on Jewish values. What will you fight for?